FRIDAY AFTERNOON WAS a great example of riding the highs and lows of retail, running your own small business, and feeling the love from customers. It started when Sheryl left early. The Tin Dusters were arriving early and clogging up the parking, and it had been a long week. She went home to hang out with the dogs and recover with no-carb pancakes. It had been pretty quiet all day, but as soon as she left around 3, you guessed it - the place went nuts. One of my favorite people in the world is Ginny Steinkamp, and her awesome parents, Wendy and Dale. Ginny is a senior now at Quincy Notre Dame and she was one of my best guitar students a few years back - she's progressed incredibly on her own and I'm very proud of her. She was getting her senior pictures taken in and by the store, and Wendy decided to buy her a very nice Levy guitar strap. "She never spends her own money. This is so worth it!" Wendy said. It looks great with her beautiful blue Dean acoustic guitar. We made her happy. Then a guy walks in, and you know how you can tell some people have an attitude as soon as you see them? Yup. This guy had it. "CAPOS," he barked. "Where are they?" I pointed him in the right direction, and immediately I heard a stream of foul language and accusations we were trying to rip him off. I ignored him. He came to the counter with a capo and literally threw it to me. "I can't believe you charge so much for a stupid capo," he said. Actually, it's a smart capo, smarter than you, made by Kyser, and too bad you didn't buy the orange one because it makes you play better. I later checked and we actually charge less than some of the online places. There were a million other things I wanted to say to the guy, but there were other people in the store and I just bit my tongue. "Well, everybody has to make a living," he growled. I wanted to stand up and scream at him, and tell him every single dime we take in goes into paying bills, keeping up a historic old building in downtown Quincy, and growing the business. Of course the guy pulled out a $50 bill from a fat wallet. He walked away and I couldn't help myself, and bleeped out what I thought of him as he got into his car and drove away. I apologized to Wendy and the other folks in the room. "I wouldn't have put up with it," one of them said. Not five minutes later, one of our better store customers and guitar players walked in and dropped $100 without blinking an eye - he bought a Big River harmonica, strings, picks and two Snark tuners. He was happy. I was happy. I forgot about crabby capo guy. 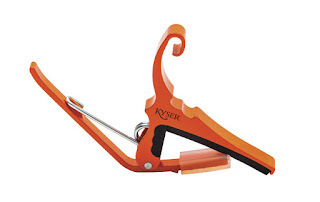 Wait a second ... Crabby Capo Guy would make a great band name! See? You always gotta look on the bright side around here. The moral of the story is you learn to deal with all kids of people when you are in a small business. The overwhelming number are positive and joys to work with and to help. They understand the challenges of running a small business in a small town. Our in-store special runs through Christmas, spend $150 in our store and receive two free restrings that include the strings. You get to pick from a variety of strings and have your acoustic or electric guitar restrung by a professional. What a deal! Now I'm off to start my new band, Crabby Capo Guy. How can anyone, who is a GOOD musician, be that crabby???? Who said he was good? He was crabby, that's all I know!